Instance leveling is a popular part of World of Warcraft. 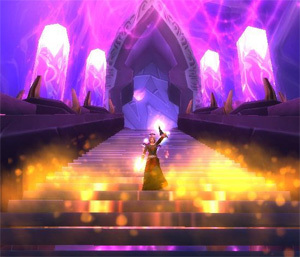 Players who don’t have a large group of friends who also play WoW always used to skip all the quests associated with the five-man instances, especially the lower level ones, but now the dungeon finder allows everyone to experience all of the instances. Here’s a quick rundown of the best instances by level for the classic dungeons, which are all the ones that existed before the Burning Crusade expansion came along. Of course some levels only have one instance to choose from, so choosing the best instances by level for those was very easy. You can’t start using the dungeon finder until you reach level 15, so that’s where we’ll start. Levels 15-17: Ragefire Chasm – Right out of the gate, players who are instance leveling through the dungeon finder will draw Ragefire Chasm, which always used to be a Horde-only dungeon. However, thanks to the new instance leveling system, Alliance can run this one too. Levels 17-22: Deadmines – This is the classic early instance for the Alliance. Many players always used to group up and run the Deadmines even without the dungeon finder, but now it’s easier than ever, and Horde can run it too. Levels 22-27: Blackfathom Deeps – Blackfathom Deeps is an underwater dungeon located in the Ashenvale area. Once again we have an example of Horde players getting the chance to cross over and play an Alliance instance. Levels 27-32: Gnomeregan or Razorfen Kraul – These two instances are pretty much a toss-up. Gnomeregan is the Alliance dungeon, and Razorfen Kraul is the Horde instance, but the dungeon finder allows players of both factions to play both of these two instances. Levels 30-42: Scarlet Monastery – Levels 30 and 40 will fly by while you’re running any of the four Scarlet Monastery instances. They’re really about the same, and it’s very difficult to tell the difference between them once you’re inside. Levels 42-47: Zul’Farrak – ZF is another instance many players use to play even without the dungeon finder. It’s huge, there’s an extra boss to do, and the drops in this instance make it worthwilfe for the entire four levels. Levels 47-52: Temple of Atal’Hakkar – The Sunken Temple is another instance that seems to come up an awful lot for these levels, but it really can be a rather quick run despite its size, and you learn to either love it or hate it. Levels 52-60: Blackrock Depths — Players in this level range will get tired of seeing Blackrock Depths because it is the only instance for much of this level range. However, the good news is that the more you run it, the more you’ll run across players who have keys to unlock new parts of the instance. Also starting this instance at level 48 will really help you burn on to level 50 quickly. At level 58, your best bet is to cross over to the Outlands and begin running Burning Crusades instances, but there are a couple of classic ones like Molten Core that are still worth a run or two at this point.